Asli Bicer, marketing director at Eczacıbaşı Consumer Products, talks to TWM. Asli Bicer: “Eczacıbaşı Consumer Products has been at the forefront of Turkey’s tissue paper market since its establishment in 1969 as İpek Kağıt Tissue Paper. Today, we dominate Turkey’s bathroom and facial tissue, napkin, handkerchief, and paper towel categories with the five most popular brands: Selpak, Solo, Silen and Servis for retail customers and Selpak Professional for AfH use. Selpak offers the highest quality, premium priced products whilst Solo is positioned as the value-for-money brand. Silen and Servis offer products at affordable prices. “As the first brand in Turkey’s tissue paper market Selpak was largely responsible for generating consumer awareness of the benefits of toilet tissue when it introduced this product in Turkey more than 45 years ago. This pioneering role has given it a unique expertise which it has dedicated to setting new standards in each segment of the tissue paper market. TWM/2: What trends are you seeing in these markets? Bicer: “The total retail tissue paper market reached two billion Turkish Lira in 2017 with a growth of around 18% (year-end 2017 Nielsen, value; TL) in Turkey. We are the market leader in the tissue paper market, in Turkey (year-end 2017 Nielsen, Value; TL). “The toilet paper category constitutes 50% of retail tissue paper market while the share of paper towel category is 30% with the highest growth rate, 21%. The paper napkin category – with the third largest share of market (15%) – has the lowest growth rate among the other categories. “Paper towel’s contribution is significant to the market growth mainly due to the expansion of its usage area. It is not limited to the kitchen – there is an increasing trend of usage in bathroom for various purposes such as drying the face and hands, wiping surfaces and mirrors. “Growth figures in the categories are also in line with household penetration measured by IPSOS. According to the year-end data, while the penetration of toilet paper has been almost stable for the last three years with around 83%, the penetration of the paper towel has increased to 70% from 75% in the same period. “Volume growth in Turkey is mainly driven by urbanisation and population growth. Tissue and hygiene demonstrated dynamic volume growth due to the rise in the population, and the fact that it became easier to access fast-moving consumer goods in the country in general, following the rapid spread of retailers’ small format shops and particularly discount stores. TWM/3: Have you made any new machinery investments, and if so, why and what are they? Bicer: “In 2016, two new plants in Turkey and Kazakhstan started production that would advance the company’s goal of being a regional powerhouse. The cumulative value of the investments was over TL 300m. 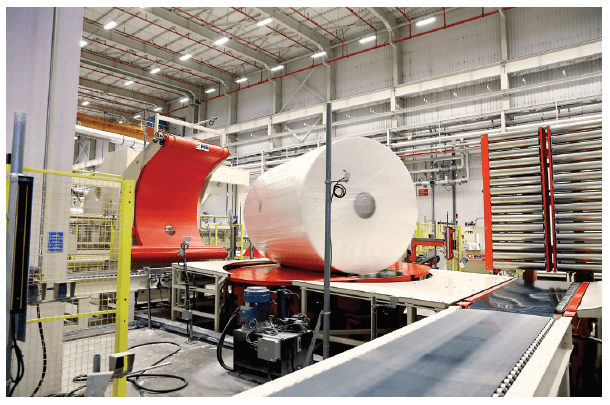 “In Manisa, we started up a new paper machine that has increased its overall tissue paper production capacity by 65% from 110,000 to 180,000 tonnes. In Kazakhstan, we moved our issue paper operation from Almaty to a newly constructed facility in Astana. “A new converting plant in Astana will support our entry into Russia as well as enable further expansion into Central Asia. The advanced technology incorporated in this facility, which covers an area of 50,000 square metres, has both doubled the capacity in Kazakhstan and reduced operating costs. TWM/4: How will you continue to grow your market share? Bicer: “In this competitive environment, the first of our two most important objectives is to maintain our leadership in Turkey, while the second is to grow faster in international markets. Bicer: “The current historically high pulp prices challenged tissue producers in 2017 and 2018. Since pulp needs to be imported and no locally manufactured market pulp is available on the Turkish marketplace, high pulp prices (in US dollars) significantly impact the costs due to the fact that the value of Turkish lira has dropped around 12% (2018 first half versus 2017 first half) this year against the US dollar. “Pulp prices have been experiencing a 39% (2018 first half versus 2017 first half) increase in US Dollar, where some adverse effects, namely the stagnation of a number of traditional export markets, as well as the fluctuation of foreign exchange rates result in a remarkable challenge to generate the same profit. “Due to the recent fluctuations in the Turkish economy (the Consumer Price Index increased 13% and producers price index increased to 19% on average), affordability remains an issue for many consumers. As many consumers classify paper products as a commodity product, they seek for more affordable products in the market. TWM/6: What potential is there for you to export? Bicer: “In recent years we have increased our focus on international markets; today, our products are sold in more than 80 countries on five continents. Selpak has been the leader in many countries as a result of consistent and continuous marketing investment made since the mid-2000s and it takes the first place in different categories in Cyprus, Kazakhstan, Azerbaijan, Georgia, Iraq, Ukraine and Mongolia. TWM/7: Do you produce many environmentally friendly products? “We have moved forward on our sustainability agenda, keenly aware that the progress we make in this area will determine our long-term competitiveness. TWM/8: What are the three main opportunities for you in the Turkish tissue market? Bicer: “The first is multifunctional and value-added tissue. As incomes rise, consumers are developing sophisticated tastes and are continually seeking a higher quality of life. Household tissue paper brands need to consider new secondary benefits that will please consumers. Value-added benefits are crucial in tissue innovation to drive category value growth. The industry has seen a wide range of value-added benefits from ingredients to product, to design and quality, too functional benefits. Products that address the need for convenience and provide savings in time and effort hold a strong competitive advantage for the time-strapped consumers of today. In order for tissue consumers to consider paying a premium price, added-value features must provide a meaningful benefit. New products that are proven to save time, clean better and improve skin outcomes will garner consumer attention. “Consumers expect multifunctional products to achieve more with less. Manufacturers need to persuade consumers of the benefits of using paper towel to clean their kitchens, as well as absorbing oil from cooking. There is more potential for paper products that are not only skin-friendly but have added skin benefits. In highly competitive market, where purchase decisions are usually based on price, tissue manufacturers use packaging innovations to increase the attractiveness of the product and help it stand out on crowded shelves. Although this is a functional category, there is room for products to be more decorative to overcome a boring image. Products launched with special designs are popular but brands can look for more opportunities to create decorated or coloured “limited editions” to add a touch of style to the kitchen and the bathroom. “Second, is evolving e-commerce trends; online retail has gained further share of sales in consumer tissue. While price is one of the key motivators for the consumer shift, online retail also presents opportunities for convenience of reordering household staples. The number of regular broadband internet users increased rapidly in Turkey in recent years, thanks to heavy infrastructure investments by internet providers and the introduction of mobile broadband. Along with the spread of internet and increasing reliance on digital payment methods, the proportion of consumers opting to do their daily shopping through internet retailers has rapidly increased. “Ongoing modernisation is being seen in the retail landscape, with an increasing number of outlets in supermarkets and discounters and the spread of internet retailing. This will continue to have a positive impact on volume sales in tissue and hygiene and on annual per capita consumption in the coming years, as it plays a key role in the gradual rise in the number of the first-time buyers of FMCG, including tissue and hygiene products. “Shipping tissue products is still not particularly cost-efficient. However, e-commerce sites that have been seeking to offer convenience of re-ordering for staples, as well as options such as click & collect, help raise the proportion of online sales. “Consumers increasingly expect easier and more convenient access to products, especially household staples purchased on a regular basis. As a result, e-commerce has been gaining share of sales in consumer tissue, although current share of tissue online sales falls far behind online sales in disposable hygiene products. The majority of consumers still shop in regular stores, which remain important to showcase brands and draw consumers. “Lastly, sustainability is a key opportunity. Consumers are redefining what “healthy” and “better for me” mean, increasingly demanding to be offered alternatives that are natural, green, organic and free-from products. “Rising environmental awareness will benefit brands that offer eco-friendly products and have strong sustainability credentials. Over the coming years, concerns over environmental protection will increasingly place the sustainability practices of manufacturers under the spotlight and drive the growth of sustainable tissue products. This will be taken up by all levels of society, from governments to manufacturers, and even retailers. The increased pressure from consumers, governments and retailers will push manufacturers to attain third-party accreditation and maintain responsible forest management practices. Consumers will be more inclined to pay more to organisations that align with their personal values and causes. TWM/9: And the three key challenges? Bicer: “Private label is the key challenge. The Turkish tissue paper market is a highly competitive and challenging market as we are in competition with many different brands as well as private labels. Private label is growing rapidly because these products are an economic alternative especially for discounters’ shoppers. While premium-quality tissue meets the demand among some mid-and high-income consumers, private label continues to gain share in many markets, including developing regions, as its availability and quality improves and manufacturers and retailers invest in expanding production capacities. Growth of discounters also creates a platform for further private label expansion. “While rising incomes and the desire for high-quality products benefits the ultra-premium segment, brands are making a conscious effort to serve the needs of all consumers by launching value for money products that do not compromise on quality. “Value-added innovation is second: innovation is the key for brand differentiation, especially the categories such as tissue. Understanding consumer segmentation and respective needs in each market is crucial to defining brand strategies and expectations. While many consumers seek bargains when it comes to the tissue paper category, innovation that offers tangible benefits to households can open doors to more value-added spending on the part of consumers, and subsequently to revenue growth. “However, the industry has not been known for a fast-paced innovation agenda. In the future, for many companies, getting efficient innovation practices and the organisation up to speed will be an important challenge. Bigger brands are struggling to find growth as new technologies enable disruptive challengers to enter the arena and expand the competitive frame. Manufacturers are targeting the expanding middle-to high-income segment through high-quality, value-added products with a luxurious feel and other added features. Rising incomes and the desire to trade up to premium goods, as well as the evolving needs and habits of consumers in Turkey, are driving demand for tissue products which are thicker, softer and stronger. Despite the fact that many consumers are willing to spend more for quality when it comes to paper products, margins remain an issue for manufacturers while for consumers, price remains an important factor when choosing paper products. Manufacturers therefore need a provable value proposition to convince consumers to spend more. Brand owners are using innovative approaches to solidify their premium positioning and stand out in an overcrowded marketplace. “And lastly, pressure for profit / minimising costs: driven by cost inflation (thanks to continuously increasing pulp prices and devaluation of the Turkish Lira), the market has set higher expectations to maximise profitable growth. The last six months have been unusual to say the least for the global pulp market, with numerous price increases in a relatively short period of time – something no one had foreseen at the beginning of last year – neither buyers, nor sellers, nor analysts. “At times of tight profit margins and significant competitive pressures, innovation in the premium segment is on the industry agenda to support brand equity and differentiation from the competition, to safeguard margins (especially when coupled with cost efficiencies), and build long-term growth strategies. Companies have to figure out how to push their own price increases through in a better way. On the downside,however, premium products reach a smaller consumer base, and still come under price pressure from retailers. The price competition with private label eats into manufactures’ profit margins. Hence, minimising operational costs has shown to be crucial for survival in an increasingly competitive market. Share the post "“ We consider competition as a factor that grows the market, increases quality, triggers category and product development, and we try to benefit from it in all circumstances.”"